But it's too easy to reduce P&P to just a love story. To do so is to completely detract from Austen's talent as a writer and observer of human nature. Any idiot can put together a captivating romance. Yes, Austen wrote period love stories, but embedded in these love stories is social commentary - about the military, the economy, the role of women, the role of men, the importance of literacy and exercise, fashion, society, familial relations, etc - and it's written in sharp, witty, intelligent prose. Austen's use of the English language is absolutely perfect. I know that Austen's novels have been fodder for insipid rom-coms, and people who've never really studied her would like to think of her novels as being shallow romance, but that could not be further from the truth. 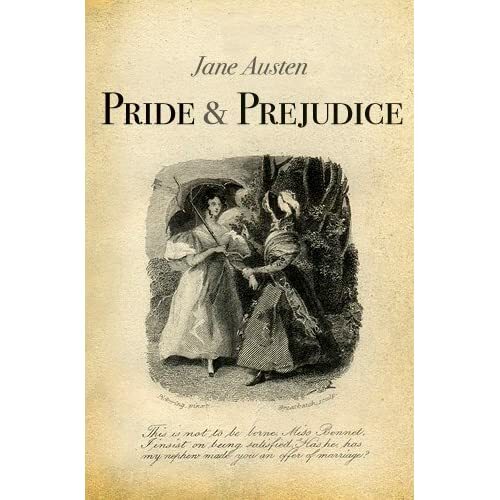 P&P is perhaps Austen's most beloved novel, because Elizabeth Bennet is spunky and independent and playful. (BTW, people like to think of Elizabeth as a modern girl, but she really wasn't. She was very much a believer in the rules of propriety and she stays firmly in-bounds.) She challenges Mr. Darcy, she steps up to him, and he falls in love with her for it, and eventually they get married, yay. Okay, but also take a look at the importance of marriage in a society like that - marriage was pretty much a girl's only option. And in a family like the Bennets, where there are only girls and none of them can inherit the family home, it becomes a necessity to marry a guy who can support you. Elizabeth faces the problem of whether she should marry for comfort or marry for love (and luckily for her, that actually no longer is a problem by the end of the book). Look at the other marriages in the novel for contrast - there needs to be a balance of love (passion), respect, and financial security for a happy marriage in Austenland, and the marriages that lack any of those components are not painted favorably. There are so many layers to peel away with P&P, and every time I re-read it, I pick up on new things. Yes, at the end of the day, my heart flutters when Mr. Darcy says "You must allow me to tell you how ardently I admire and love you," (yes I typed that from memory) but it isn't JUST that. It's also all the intellectual English-major stuff that's in there too. And that's why it's my favorite book. It's beloved by both trashy romance novel readers and snobby Ivy League scholars alike, by both men and women alike. Austen is one of the most treasured British authors of all time for a reason. And by the way, here's my Master's thesis. This disappoints me! Why does everyone love this book so much? I often use this book as a description of my least favorite book of all time. It's like reading a romantic comedy - so predictable. Dude, did you not read a single word I just wrote? I just explained how P&P is so much MORE than just a romantic comedy. Anyone who reads P&P purely for plot is missing out on like 90% of what makes it so genius.